The artist completing the installation in Genéve. 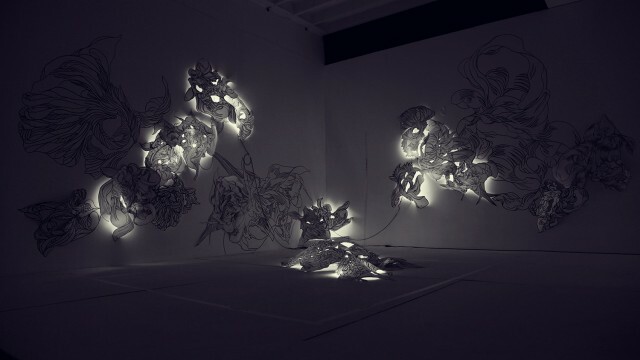 Chiaroscuro is an installation work by Sougwen Chung, the Canadian-born, New York-based illustrator/media artist. Veering far from the mechanical minimalism of so much projection mapping, with its hard edges and rectangular conformity, Sougwen instead uses light and animation to draw outside the lines. Shimmering as though refracted through a digital ocean, the animation lights up the outlines of hand-drawn forms in one moment, then spills out onto the walls and floor in the next. Set to Praveen Sharma’s exotic and evocative score of rushing pads and alien percussion, the effect is irresistible. It was for me (and many others) a real highlight of this year’s Mapping Festival, which commissioned the project for their exhibition at Musee D’art Moderne et Contemporain Géneve in Switzerland. 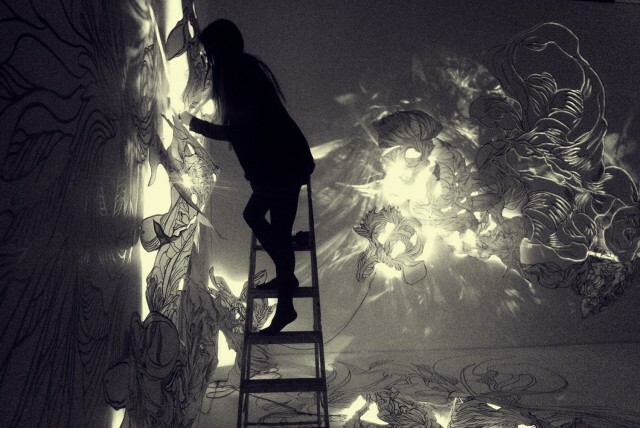 Playing on the notion of light and shadow, Sougwen’s drawings pop out of the flat white-box gallery as though some kind of coral reef. 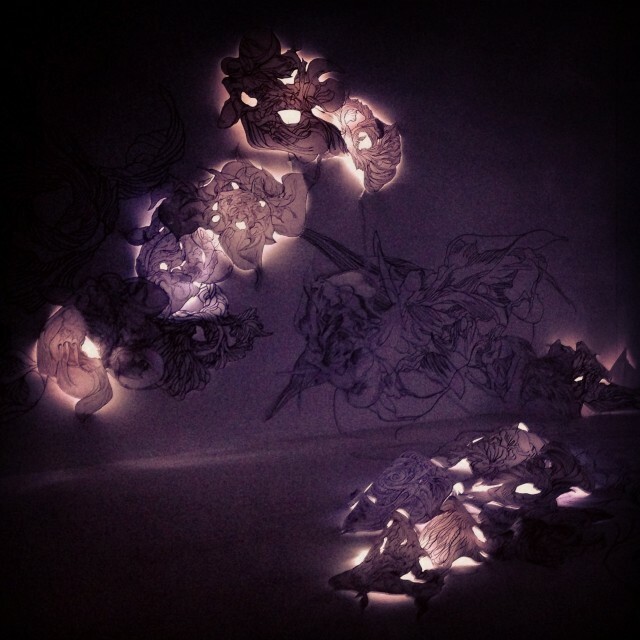 The drawing themselves are black and white, in a suspended bas relief construction in paper, with lighting tucked in behind and projection augmenting the drawings. And her visual style translates beautifully to the work, organic baroque flourish blooming in florid detail. CHIAROSCURO — Installation by Sougwen Chung from sougwen on Vimeo. In technical terms, triple-head projection is combined with RGB LED strips controlled by Arduino Teensy 3.0. MadMapper outputs the projection. The physical construction is Rives BFK Paper, magnets, and to provide the illusion of suspending the drawing structures off the surfaces of the gallery, a set of welded-steel support prisms. 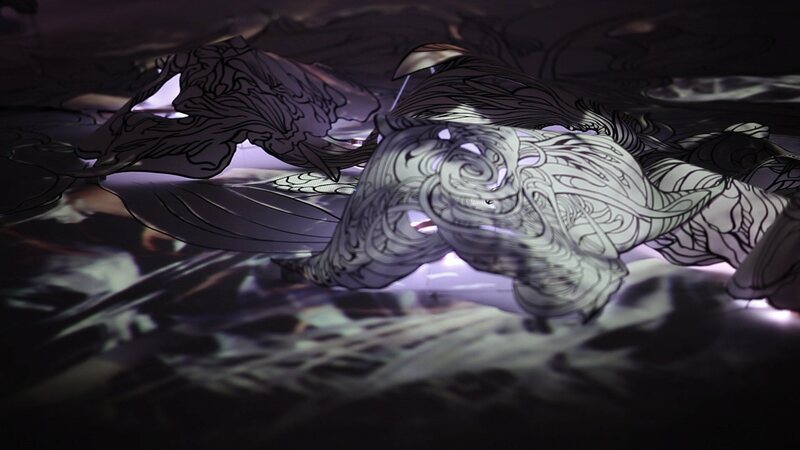 It’s drawing as animated sculpture. Chiaroscuro is a culmination of contrasts; the interplay of light and dark, the tangible and intangible, the old and new. The installation is a contemporary interpretation of “Chiaroscuro” — a term more commonly associated with 17th century painting that is as hand-made as it is digitally enabled. Drawing in the installation is the fundamental element — spanning the physical structure, the light-mapping and the projection itself. By digitizing the drawing, the simple expression of mark-making becomes transmutable. It is reinterpreted to take on a new form and dimension in the software — it transforms into structures manipulatable through time. If drawing is an analogy for basic human expression, Chiaroscuro is an immersive installation that augments the drawn image in scale, sound, and scope by harnessing the imaginative potential of interdisciplinary processes and technologies.